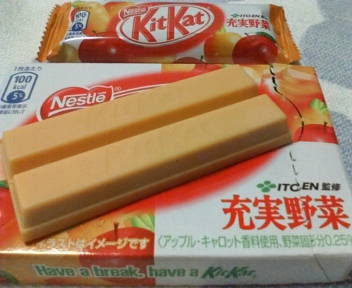 I tried two new kit-kats this week: Maple and "Complete Vegetable". They were both quite tasty in and of themselves, but neither were real standouts. The maple was your standard white chocolate Kit-kat with just a tiny hint of maple syrup. Like the rose variety I thought it was good, but just not mapley enough. 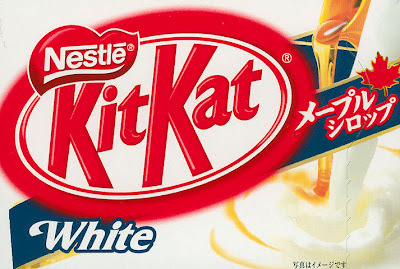 They ought to have made the maple flavor a bit more prominent; as it is, it felt too similar to other white chocolate kit-kats I've had and lacked personality. The vegetable was a little better. It had a quite charming orange sherbet color as you can see, and a light fruity smell. The flavor was a nice mix of carrot and some kind of fruit (apple? orange? ), but as with the maple, it could have had a bit more kick. 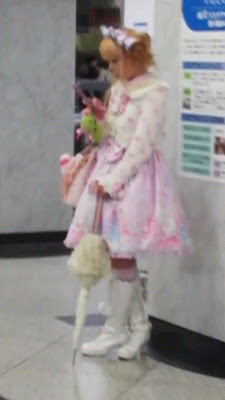 Last Monday Rin and I went in to Osaka to do some textbook shopping and we saw a pink Goth-Loli at the station. The picture's a little blurry 'cause I took it from kinda far away but I hope you like it. 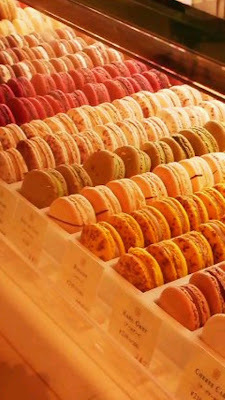 We also went in search of macarons and found paradise on earth. A few weeks ago my friends Shiho and Naoko gave me a box of the most delicious macarons ever and said they were from the Hankyu Department Store. I went there but they didn't have the same ones, but fortunately they had even MORE delicious ones (if that's even possible). I had a cassis-violet, a yuzu (a type of citron) and a raspberry chocolate macaron. Perfection!